Guys, I made trousers! Yep, you heard me – TROUSERS! To be honest, I’m still wondering why. I don’t wear trousers. I’m not sure I really like trousers (for me). I own precisely one pair of jeans that I wear when camping or country-walk-walking and a pair of black stretch trousers that I got for about £2 at a charity shop. So whatever possessed me to make them, I’m not sure. But I did. And you know what? It was ok, and I learnt some things too, which is always good. And best of all, they look like proper trousers! Why trousers? As I was leafing through the Love Sewing magazine I spotted this cute pair of Paperboy Trousers. The pattern is a Wardrobe By Me pattern that was featured in the magazine, along with an article about the founder, Christina. Free PDF (and I do LURVE a PDF!) I loved the colour and style and kept going back for a little look, so after a while I thought, come on, why not just give it a go? 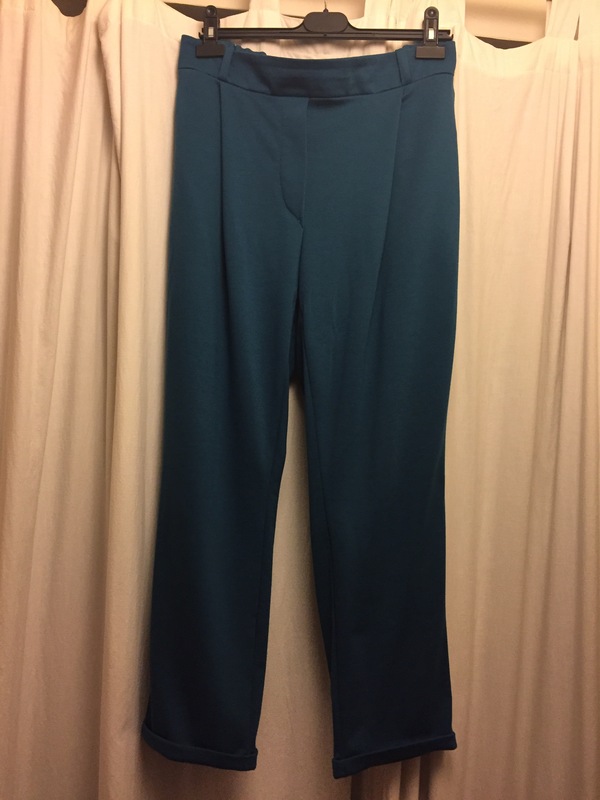 The pattern calls for only 1.5m of fabric – much less than the normal dresses I make, so I ordered a lovely teal Ponte Roma and thought “what the hell – if they’re awful, it’s only £11 (including postage) I’ve forked out. No biggie.” The pocket facings were cotton poplin from my stash. So, I like quick sewing. I like to start something and have it finished the same night, or the next night at a push. This pattern was fine – completed in two nights but only because I didn’t have the required width of elastic in my stash. I learnt some new things (pockets with facings, belt loops and false fly) and realised while working on it that I have come quite a long way in my sewing journey – I could spot where there was a small printing error in the pattern (before I cut the pattern pieces and fabric!) and also could read between the lines of the instructions (I don’t think it’s suitable for complete beginners). 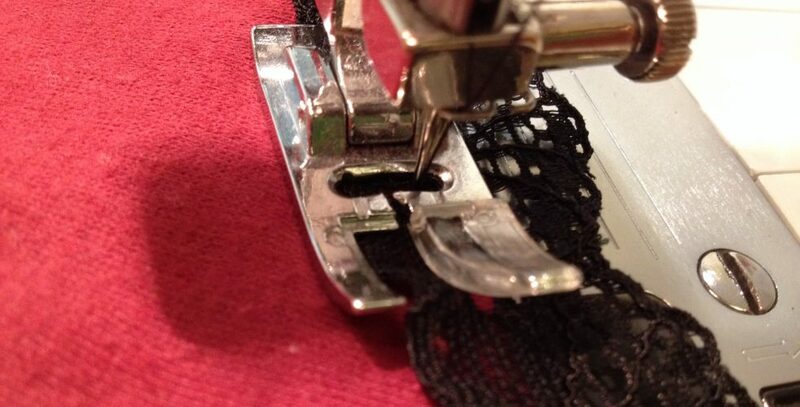 Making the pockets – with facings! I love the colour of the trousers, although I don’t have much that “go” with them, because I mostly wear dresses and am not really one for separates (cue online search for sewing patterns for tops and tees!) I do also think I should have gone with my instincts and cut the slightly smaller size 12 rather than the 14 (waist measurement was nearly 14 but hips 12 so I erred on the side of caution and thought I’d cut 14 all through and take the side seams in if necessary, but in the end the waist was also a bit big too, and I’d already done the pockets so couldn’t really take in side seams on hips.) Another lesson learned! But they’re ok. I am still not sure I like me in trousers – maybe some more fitted ones would be good as these are quite baggy and make me feel a bit ‘hippy’ (of the too-much-on-the-hips rather than flowers-in-your-hair variety). But I am mostly proud of going out of my comfort zone and making actual trousers – YAY! Houston – we have belt loops! I’m planning action! I’d like to step up my game, increase my output and make more sales. I’ve already planned in a few craft fairs/events this year and have others on the back burner (watch this space), and want to try to reach a wider audience. A full-time teaching job means that time is limited for making and selling. But I love it, especially the making part! It’s my switch-off from schoolwork and lets me indulge in my creative side. Plus it gives me an excuse to buy yummy fabrics! And I get a real kick out of each and every sale, either in my Etsy shop or face-to-face. Some of you reading this are already loyal customers! So thank you to every one of you who has bought a luckybear item so far, because I love it when you choose to buy something of mine. I always hope that you will love it as much as I do! So I am determined to make more time to sew and sell. One thing I have decided to do is to take part in the Make May My Month Challenge – #makemaymymonth – , run by a fellow Etsy seller (Jade Hargreaves of The Pattern Parade Design). It’s a month of challenges to refocus you on the business and I hope it will enable me to get some things sorted. This looks like it will be great collaborative support and networking. It’s good to share the love! I am also planning some exciting special offers and giveaways, so follow me on twitter, facebook and instagram and I’ll keep you posted! Fingers crossed that May will be a productive month! If you’d like to check out what I have in stock right now, have a look at my Etsy shop. I will add new items regularly. Have a great bank holiday weekend, everyone! A very belated hello to everyone. I have really neglected this blog over the last few months, because of a new job and busy family life, not to mention the actual sewing itself! I am planning to restart a regular blog today, it being New Year and all, and hope to be able to keep you up to date with my sewing shenanigans. I spent some precious hours before and during the Christmas holidays catching up on some of the orders I received beforehand. So I have been busy trying to make them all! These included laptop & iPad cosies, totes, pencil cases and cafetiere cosies. I also made some presents for my Mum and Dad for Christmas. As usual, I was there frantically trying to get them finished in the few days before Christmas! Nothing like a bit of last-minute panicking to focus the mind! This year I have had a couple of things that were particularly popular. See photos! I had some black & white stripe fabric which was lovely but I felt was calling out for a splash of red – so I made little pouches & purses with a red felt heart applique. They sold pretty much straight away, so I will be making some more soon! Also ever-popular is the cute fox fabric. This has been requested as purses, pouches, bags and aprons this year! I am going to source more as it is well-loved. Who doesn’t love a cute little fox? I am always happy to take orders! At the moment I am working on some things made with a map print for a couple of people. I have also picked up crochet this year and have made 2 felted bowler hats and am in the middle of my first big project – Attic 24’s Cosy Stripe blanket. It is lovely and a good project for the winter months – the benefit being that it allows me to sit and catch up with TV while still creating! (Have worked my way through Seasons 1-5 of Mad Men so far!) The colours are gorgeous and it is a very satisfying and lovely thing to do! I will post photos another time of my hooking adventures!